I reviewed Tidy Tots a few months ago and I love those diapers so much! They are a unique system. 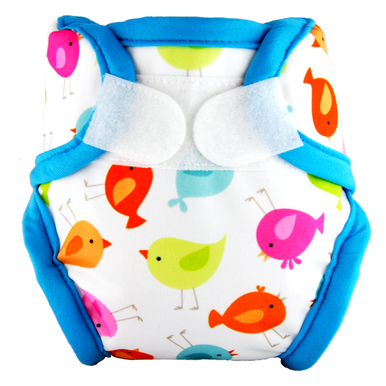 It's a one size cover without rise snaps, they automatically adjust to your baby's size and needs without adjusting snaps, which I personally LOVE! They are aplix, but are very grippy and sticky and don't come undone in the wash and are hard for baby to pick off. And they're an AI2 (all in 2) system which means you just switch out the insert and the cover is good for a while. They offer One Size sets and covers, NB sets and covers as well as accessories. NB fits from 6-16 pounds and the OS is from 10-40 pounds. Tidy Tots is definitely the way to go for anyone looking to buy an affordable system! Price: The essential set (pictured above) is normally $99.95 but is on sale until December 4th for $79.96. This is 2 covers, 4 inserts and boosters, a wet bag and a roll of flushies (flushable liners). For the Merry Fluffy Christmas Grand Prize, Tidy Tots is offering one reader the chance to win an essential set worth $100!!! Giveaway goes live at MIDNIGHT!! I have wanted to try Tidy Tots diapers because I have heard great things about them. I like that they have strong aplix which I prefer. Thank you for the review! I'd love to try these diapers!! They look super cute and convenient! I'm fascinated by a one size without rise snaps. I'd love to try these! This is such a great bundle! Perfect for a first time mommy (my daughter)! I have never heard of Tidy Tots but they look adorable and I would like to give them a try. Love that they have two sizes. It's so hard to get a good fit for newborns with just OS systems. Thus would be a dream come true! I have never heard of Tidy Tots until reading this review. They look pretty cool and I think we will have to try them out for my little guy! The essential set looks very nice. Thanks for sharing!